Ride 365 – Lake Shore H.O.G. Harley’s latest thing to get us all to ride, ride, RIDE. You check in your mileage with Kory at the dealership and then ride. Before the end of the year, you check in with him again your Lifetime, Annual and Chapter mileage gets updated. Then we see who wins. It’s that easy, so give it a try! The miles you ride show your dedication to freedom and the open road. Whether it's an afternoon getaway or a transcontinental journey of a lifetime every ride you take brings us closer together. 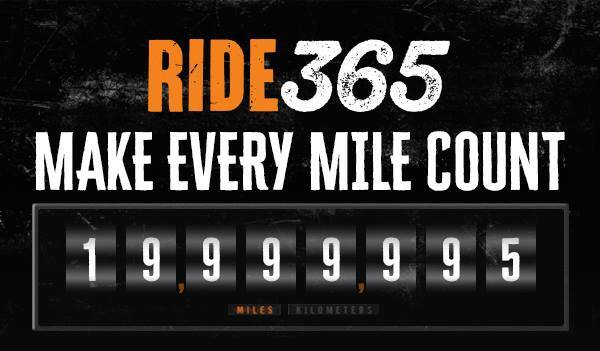 Keep track of your lifetime miles, because the miles count. If you aren't enrolled in the Lifetime Mileage Program, see your dealer to enroll. Miles shown reflect miles earned and entered by a dealer since enrollment into the H.O.G. mileage program and might not reflect all miles ridden. Check with your dealer with questions. Read our FAQs for more information. It is the mission of the Lake Shore Chapter of the Harley Owners Group to bring members together for the common interest of promoting local motorcycling activities for these members. Our chapter goal is to generate an increased level of enthusiasm for riding Harley-Davidson Motorcycles and to promote the advancement and improvement of the Harley Owners Group. The Lake Shore Chapter is chartered as a “Family Oriented Social Organization” and is dedicated to the betterment of motorcycle riding and safety. We are the Harley Owners Group of Lake Shore Chapter #3522 in Libertyville, IL. ©2018 Lake Shore H.O.G. Questions or comments? Contact our Webmaster.